Hi, Good morning. Thank you, friends and viewers. 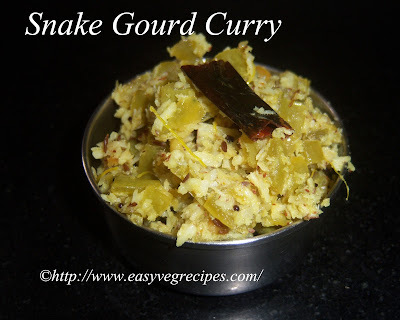 Today I will post how to make snake gourd curry recipe. It is another simple and easy recipe from my kitchen. Snake gourd is a twisty, long vegetable which is grown in most of South East Asian countries. It has all nutrients, vitamins, and mineral required to a healthy body. Whenever we get it in the local markets, we buy that and make different varieties with it. We can prepare perugu pachadi with it(added curd to the curry), it can be served with rice or roti. We can add coconut, til powder or milk to the curry. 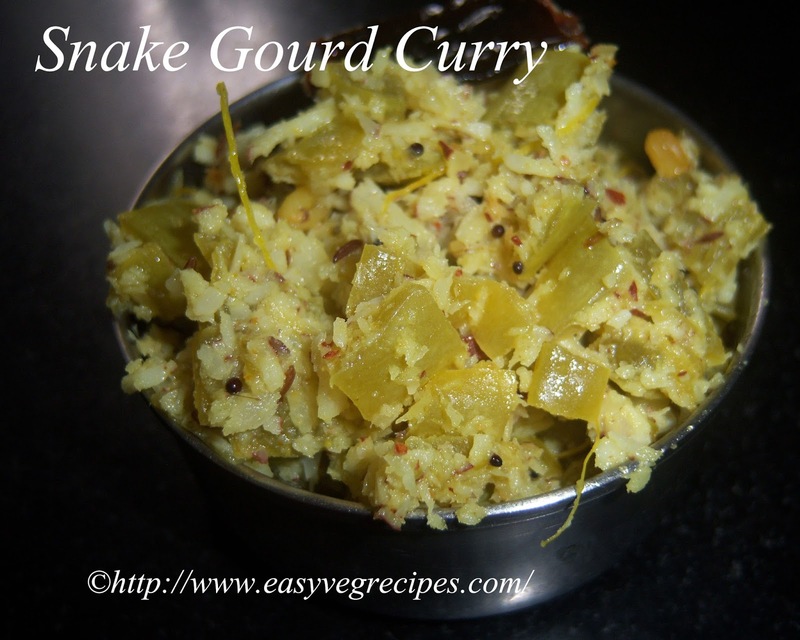 We can make curry with moong dal and snake gourd. Snake Gourd Curry -- Sauteed snake gourd with fresh coconut. Wash and chop snake gourd into 2" inches square cubes. Chop and grate fresh coconut, Slit green chillies. When they started turning into brown colour, add mustard seeds and cumin seeds. Once they starte spluttering add split green chillies and curry leaves to it. Fry them for a while. When they crackling add snake gourd pieces. Add salt and turmeric powder. Add little water, if necesssary. Allow them to cook till they turn soft. To check, press one piece of it with your fingers. If it smashes softly then it is done. Let the moisture in the curry evaporates completely and the curry dries fully. Add freshly grated coconut to it. Mix it well. Serve snake gourd curry with rice.